Bob Donald joined Slow Food Aberdeen City & Shire in May 2016 and was elected on to its committee as Secretary in July 2016. Bob is a semi retired private chef and what feels like a full time allotmenteer, growing his own fruit and veg at the Niggfield allotments in Aberdeen. After working in finance in the oil and gas sector for almost 30 years, a change of career was in order and he enrolled at Aberdeen College and studied to become a chef, gaining a City & Guilds in Advanced Professional Cookery in 2012. 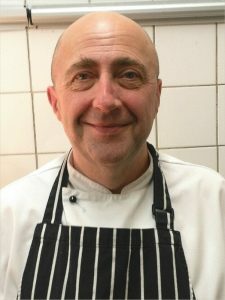 Bob has worked in various restaurants in Aberdeen. Bob is also a volunteer at CFINE, a charity who are the lead partner in the Aberdeen Foodbank Partnership which tackles poverty and food poverty as well as distributing food parcels to community groups and people in need throughout Aberdeen City & Shire. He is currently assisting them in the commercialisation of their new community kitchen. The facility was created to bring groups from all areas and backgrounds into an environment that would allow them to learn how to cook meals and eat together in a social space. He also volunteers for The Allotment Market Stall at Duthie Park on Fridays, putting the slow food philosophy into practice by selling excess locally grown fruit and veg from allotments around Aberdeen.